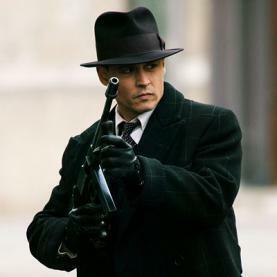 Johnny Depp as John Dillinger. Public Enemy #1 in the roaring 30's, was a hero to the public for robbing banks. He escaped the clutches of the FBI for many years till they finally shot him.. Wallpaper and background images in the Serial Killers club. This Serial Killers photo might contain schütze, filzhut, homburg, stetson, trilby, fedora, stetson trilby, green beret, besondere kräfte, elitesoldaten, grüne barett, spezialeinheiten, elite soldat, and elite-soldat.